Ninth Avenue at Main Street, looking east on Ninth. The building on the northeast corner was a restaurant until recently. I don't recall what's in there now. The building on the other corner is now Corner Bank. 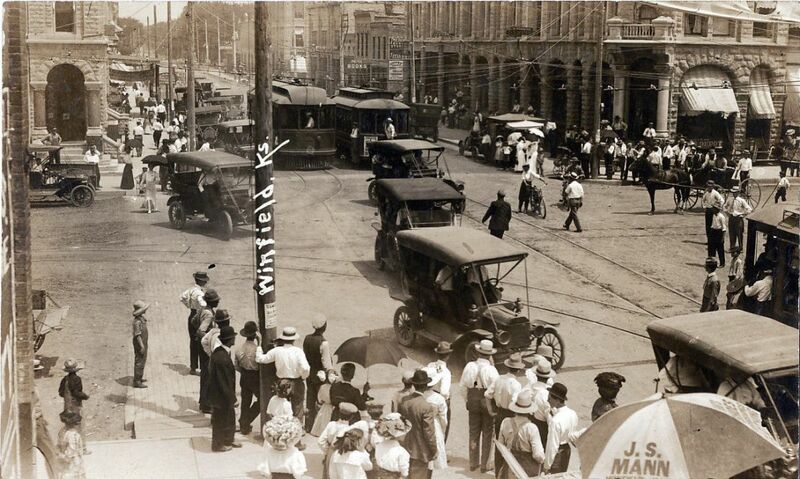 Arkansas City and Winfield both had trolley systems, and there was also an interurban line between the two towns. I bet that is a wing script radiator if it could be lightened up. Is that Steve standing on the sidewalk in the foreground? Can't quite make out if there is a tape measure clipped to the front of his bibs.